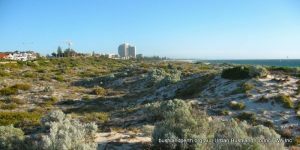 We believe that Trigg Beach and its natural dunes should be preserved as Perth’s iconic ‘bush beach.’ The Friends of Trigg Beach grew out of the fight against the ‘boardwalk’ through the Class A Reserve and Bush Forever site at the South Trigg Beach Reserve. We won that fight, and aim to make sure that there are no further development plans which would be contrary to Trigg’s ‘bush beach’ character. The most recent threat to the South Trigg dunes is the road proposed by the Metropolitan Redevelopment Authority, which would clear dunes to connect Scarborough Beach to the West Coast Highway – despite there being two connecting roads already in use. These are the steepest, deepest and best vegetated dunes between Scarborough and Trigg beaches. These amazing and unusual dunes are far more valuable as a tourist experience, creating an unusual and remarkable mix of natural and built environment in Scarborough and Trigg. What a great story these chaot and nested parabolic dunes would make for walking tours – which are the next big thing in urban tourism. We are supported by members from the Friends of Trigg Bushland, Friends of Star Swamp, Stirling Natural Environment Coastcare, Urban Bushland Council as well as local residents. Or see us on YouTube.